AleaSoft, February 11, 2019. 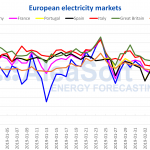 AleaSoft analyses the behaviour of the European electricity markets in the first days of February. Wind energy production caused the electricity markets to fall in this second week of February, although a slight rise in temperature also influenced in the corresponding drop of demand, as well as a slight drop of gas and coal prices. The price of Brent oil futures in the ICE market for April remains stationary around 62 $/bbl. As already mentioned in the analyses of previous weeks of AleaSoft, this equilibrium trend will be maintained unless the situation in Venezuela becomes complicated. If everything remains the same, the Brent price will oscillate in the coming weeks in a range between 60 and 62 $/bbl with a tendency to stabilize at 60 $/bbl in the mid-term. TTF gas futures for March continued to fall the second week of February, following the trend that started last September; from 19.36 €/MWh on Monday, February 4 until the 18.26 €/MWh on Friday 8. At the beginning of the week of February 11 they are traded below 18 €/MWh. These values were not seen since the beginning of March 2018. This downward trend will continue for the rest of February. As in last week, API 2 coal futures for March continue with the same downward trend as gas. From 76.80 $/t on Monday, February 4, to 72.05 $/t on Friday, February 8. With this trend, the floor of 70 $/t should be broken in the coming days. As AleaSoft commented in previous weeks, this downward trend in gas and coal prices that continued last week may influence declines in the prices of European electricity markets in the coming weeks, when the weather conditions will be more favourable and the temperatures rise. 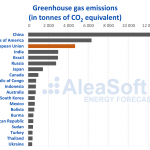 Comments made by AleaSoft last week on the prices of CO2 emission rights futures, for the reference month of December 2019, remain valid. Although during the second week of February at some point intraday prices reached 24 €/t, they are back around 22 €/t on Monday, February 11. In AleaSoft, these 22 €/t are still considered as an equilibrium value for the coming weeks. In general, the prices of electricity markets in continental Europe fell between February 4 and 11. The main drop was for the German electricity market, which fell by 27.4%, in the case of Italy, the PUN fell by 22.3% and in the case of France the drop was 17.6%. The main cause of these decreases was the high wind energy production. Less importantly, the drop in electricity demand as a result of a slight rise in temperatures also influenced. In AleaSoft it is considered that, taking into account the evolution of fuels, CO2 and temperature forecasts for the coming weeks, prices should go down to a path of around 40 €/MWh. The electricity futures of France and Germany in the EEX market for March 2019 continue with the decreasing trend that they have been experiencing since the end of December last year. Last Friday, February 8, French futures closed at 48.39 €/MWh, which represents a difference of more than 11 €/MWh compared to December 17 when they were traded at 60.05 €/MWh. Meanwhile, the German futures dropped 9.26 €/MWh from 54.17 €/MWh on December 17, to 44.91 €/MWh last Friday. Last week of February 4, the futures of Spain and Portugal for March 2019 in the OMIP market were stationary around 52 €/MWh and in the session of Friday, February 8, fell from that level to 51.50 €/MWh in the case of Spain and to 51.13 €/MWh those of Portugal. Spanish futures had a similar behaviour in the EEX market, where in the session of last Friday the traded value of March 2019 was 51.48 €/MWh. Italy futures for March 2019 in the EEX market started the week at 57.18 €/MWh on February 4 and, after a slight rise to 58.35 €/MWh on Wednesday, February 6, ended the week on Friday, February 8, at 56.47 €/MWh. Since December 20, when the futures of March 2019 were traded at 68.31 €/MWh, there has been a decrease of 11.84 €/MWh. On the other hand, last week in the MTE market operated by GME, the futures of March 2019 were around 59 €/MWh trading on Friday, February 8, at 59.35 €/MWh. In the case of the UK futures in the ICE market for March 2019, last week they remained above 53 GBP/MWh except on Friday, February 8 when they were traded at 52.06 GBP/MWh, continuing in this way the bearish path that began in December when they were traded above 65 GBP/MWh. The futures for March 2019 of the Netherlands and Belgium, both in the ICE market, remained around 50 €/MWh last week and were traded on Friday 8 February at 49.11 €/MWh and 49.32 €/MWh respectively. In the case of the futures of the Nordic countries in the ICE market, they have followed a downward path since January 23, when the future of March 2019 was traded at 56.28 €/MWh and settled last Friday, February 8 at 48.78 €/MWh, which represents a decrease of 7.50 €/MWh. In the second week of February there was a rebound in wind energy production, especially in Germany, where 934 GWh were reached on February 9. 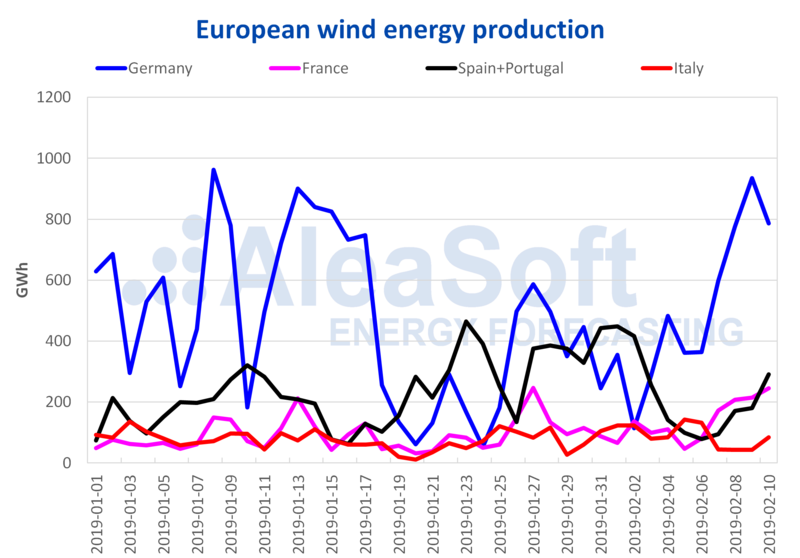 In the whole of the Iberian Peninsula, Spain and Portugal, as in France, the highest values of wind energy production were reached on February 10 with 291 GWh and 245 GWh, respectively. For the week of February 11, it is expected that wind energy production will not be as high. In the case of solar energy production, which includes both photovoltaic and solar thermal, there was also a production increase in the second week of February. In the case of Germany, the weekly production beginning on February 4 was 315 GWh. 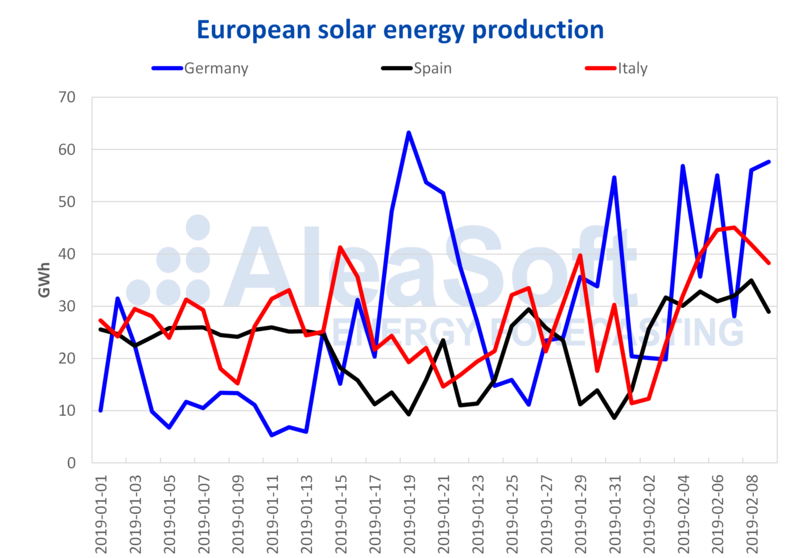 In the case of Spain, it was close to 206 GWh and in Italy 270 GWh of weekly production was reached. For these three countries, solar energy production forecasts are slightly higher for the next few weeks, considering that the number of hours of sunshine will increase.